WASHINGTON (CN) — With one week to go until President Donald Trump marks 100 days in office, protesters gathered across the country Saturday for the first-ever March for Science. Courthouse News caught up with some of the men and women at the center of the raging climate debate. 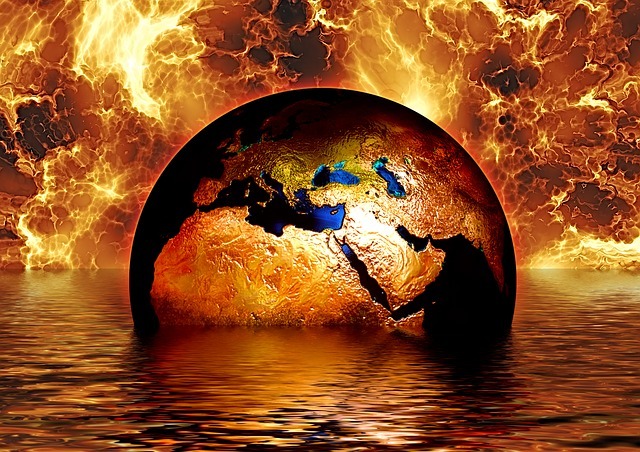 Polarization over climate science has been deepening of late, but a decade ago the Intergovernmental Panel on Climate Change had been responsible for bridging a consensus about the link between human activity and climate change. When the panel and Vice President Al Gore won the Nobel Peace Prize in 2007, the panel had just released what is known as its fourth assessment report. The panel’s upcoming sixth report is the subject of what Jessica O’Reilly has been studying as part of a 2016 grant by the National Science Foundation. Whatever consensus there is about climate change — that it “is happening, is projected to worsen, and it is accepted that some of it is caused by humans, that doesn’t mean there aren’t any gaps in knowledge or small uncertainties,” said O’Reilly, an assistant professor of international studies at Indiana University at Bloomington. “These uncertainties are often picked up by climate deniers, so I’m very interested in these matters,” O’Reilly added. Studying how assessments end up in the IPCC is critical because without the process, information can be skewed. For example, when the second and third IPCC assessment reports were published, the West Antarctic Ice Sheet was stable. New information about the ice sheet’s disintegration was available when the fourth assessment was released, but was not ready in time for publication. O’Reilly said the mounting evidence makes it harder for climate skeptics to maintain their position. “Climate change is no longer something that is happening in the future but is happening now,” she added. John Cook’s 2013 climate study famously concluded that 97 percent of climate experts are in a consensus about the role mankind has played in climate change. Even by Cook’s measures, that number is in flux. Last year Cook, a climate communications fellow for the Global Change Institute at the University of Queensland, Australia, put the consensus at 80 percent to 90 percent of climatologists. Two people who have criticized Cook’s methodology are Judith Curry, president of the Climate Forecast Applications Network, and David Legates, a former climatologist at the University of Delaware. “I and other so-called ‘deniers’ are members of the 97 percent consensus, which refers to the following: Yes, the earth’s climate has been warming overall for more than a century. Yes, humans emit CO2, and CO2 has an overall warming effect on the climate,” Curry said. Legates explained in an email that the “sad” state of climate science is keeping skeptical climatologists in the shadows. “Tak(ing) a stand that is anything short of an activist with a catastrophic view of climate change at a liberal university — which is supposed to be the champion of diverse views and positive discussions — will get you branded as a scientific heretic,” Legates said. Though he and Curry both said IPCC assessment reports can be useful, Legates warned that the reports are not gospel. Legates believes funding for climate studies lacks direction and is mired in special interests. He says the United States has embarked on a path of “environmental determinism,” which forces scientists to think and act alike. Curry, former chairwoman of the School of Earth and Atmospheric Sciences at the Georgia Institute of Technology, said she would like to see climatology turn toward study of natural climate variability factors and indirect effects of the sun on the climate. Climate-change skeptics have a friend in Washington with Scott Pruitt, the former Oklahoma attorney general whom President Trump installed at the Environmental Protection Agency. 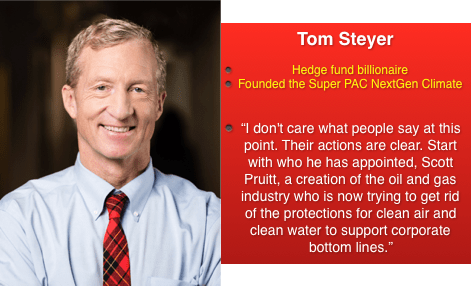 Hoping to restore scientific integrity to the topic, billionaire environmentalist Tom Steyer founded a Super PAC called NextGen Climate. The group donated roughly $87 million to liberal candidates during the 2016 elections cycle. A Steyer-founded hedge fund also donated generously to John Kerry and Hillary Clinton’s unsuccessful presidential bids in 2004 and 2008. Steyer called the description of climatology as junk science a pure political ploy. Pruitt called for a rollback of fuel-efficiency standards in March, and the EPA announced that that its new budget would cut more than 50 environmental programs and lay off 25 percent of its staff. A climate-change study that Steyer developed in 2013 with former New York City Mayor Michael Bloomberg and former Treasury Secretary Hank Paulsen predicted dire economic repercussions if climate policies were killed.